Way to Grow’s 2018 Shine Celebration provided a memorable, glamorous, and entertaining experience for over 400 guests in October of 2018. Lights, Camera, Action! was inspired by the movies and glamorous parties of Old Hollywood. Designed with vintage theaters and art deco influences in mind, the graphic identity utilizes thin line work and complex illustrations to achieve a sleek, classic look that eludes to eras gone by without directly replicating their styles. The identity was expanded to include environmental signage, posters, invitations and RSVP cards, programs, program slides, and an introductory animation. The Shine Celebration is the largest annual fundraiser for Way to Grow, an early childhood and elementary education nonprofit in Minneapolis. Raising hundreds of thousands of dollars annually, this event is an important part of Way to Grow’s annual fundraising plan, and is a valuable point of contact for current and potential new donors. 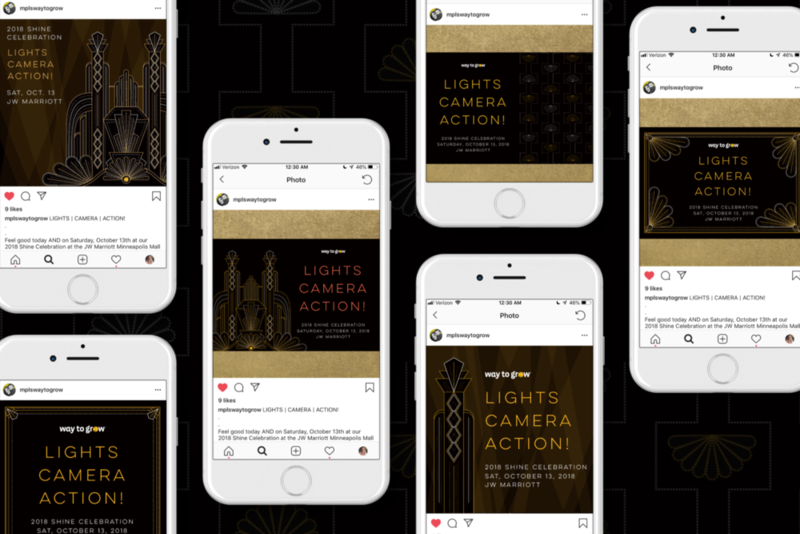 In 2018, hosted at the JW Marriott at Mall of America, Lights, Camera, Action! helped raise nearly $500,000. After several ideation sessions under my direction, the theme of Lights, Camera, Action! was selected as the gala title and theme. From there, I was solely responsible for creating the graphic identity, as well as providing art direction to an outside stylist responsible for decor. By looking at vintage theater marquees and stripping down art deco characteristics, I was able to build a library of shapes and patterns I could use across the identity. 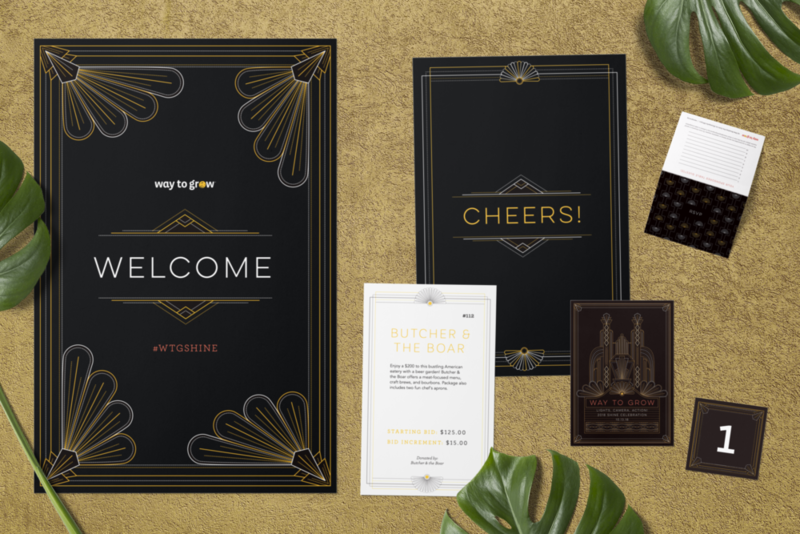 Way to Grow’s colors, use of a secondary font, and black and white images, brought a familiar feeling to the gala identity, and bridged the gap between Way to Grow and the more glamorous Old Hollywood flare.